A quality smartphone sleep app can help your whole family get some shuteye. If you suffer from insomnia and need help sleeping, there are numerous quality sleep apps available on iOS and Android smartphones, Windows 10 devices, and even the Apple Watch. Some of the best sleep apps play relaxing music or ambient sounds, while others focus on calming breathing techniques and could be considered to be more of a hypnosis app. Here are seven recommended sleep apps to help you unwind and get some shuteye. Detailed charts that break down sleep activity by the hour. Apple Health integration on iOS. No Apple Watch support feels like a missed opportunity. The app can freeze and crash on older devices like the iPhone 4S. Sleep Time is one of the best sleep tracking apps on both Android and iOS that manages to track your sleep quality without requiring a wearable such as an Apple Watch or Fitbit. All you need to do to record your sleep with Sleep Time is place your smart device on your bed's mattress while you sleep. The app will use your device's sensors to detect the amount of movement made during your session and collect all of this information in an easy-to-understand chart. This data can be used to compare your sleep quality over weekly, monthly, or even yearly periods. Sleep Time also comes with an alarm clock feature which can use your phone's vibration, ringtone, or a sound effect from the app to wake you up when you're in a light sleep cycle. The Windows 10 White Noise is a UWP app, meaning it also works with Xbox One video game consoles; great for helping kids relax after a gaming session. Sound files are very high-quality and loop perfectly. The app design is easy to navigate but isn't very attractive. The timer feature is very basic. White Noise is, as its name suggests, a white noise app that's free on Windows 10 and $1.29 on Android. The app features a clean, easy-to-use design and provides users with 50 high-quality sound files that seamlessly loop for continuous relaxation. Sound files range from flowing water and blowing wind to insects and birds; even mechanical devices such as airplanes and air conditioners. Automatically turns on when you go to bed, unlike other apps. Attractive and informative visual design. Requires iOS 10 or higher, which leaves out owners of older iPhone and iPod touch models. You'll need to pay $2.99 for this Apple Watch app. AutoSleep is an Apple Watch sleep app that's almost completely hands off. After the initial installation and setup, AutoSleep automatically detects when you go to sleep and wake up, and can even analyze the quality of your sleep using the Apple Watch's sensors. Surprisingly, AutoSleep also provides some functionality for people who don't like to wear wearables to bed by estimating how long you sleep based on when you took your Apple Watch off and when you put it back on the next morning. This same functionality also works with the iPhone and iPod touch by simply unlocking them when you wake up. Good variety of ocean and beach-related sounds. Ads in the app detract from the user experience. The looping of the sound effects isn't as smooth as it could be. If you've been looking for an app that specifically focuses on sound effects relating to the sea or beach, this free Android app has you covered. With looping sounds ranging from waves on the beach to boats and seagulls, Sea Sounds Ocean Nature Sounds will turn your Android device into the bedtime sound box you desire. The iOS version of Relax Melodies also supports the Apple TV. The app has Apple Health integration. A $9.99 monthly subscription for additional sound files is pretty expensive. Some users may find the audio mixing features to be unnecessary and confusing. Relax Melodies is an app that lets users mix and match a variety of calming sound effects and music to create the ultimate bedtime hit single. Sounds can be played individually or together with others, and combinations can be saved for quick access in a future relaxation session. This sleep app also features timer and meditation features, while the iOS version of Relax Melodies can sync Mindful Minutes data to Apple Health. The app provides up to 52 sound files for free and requires a paid monthly subscription of $9.99 for access to additional media. It's worth noting there's a $19.99 Lifetime Access one-off payment option for those who don't like recurring payments. Streamlined design that's fast and easy to use. High-quality audio content with a lot of variety. 80% of the app's features are removed after the 7-day free trial ends. $9.99 a month is a lot to pay for the additional content. Pzizz is an iOS and Android sleep app that places an emphasis on getting to sleep quickly and easily. 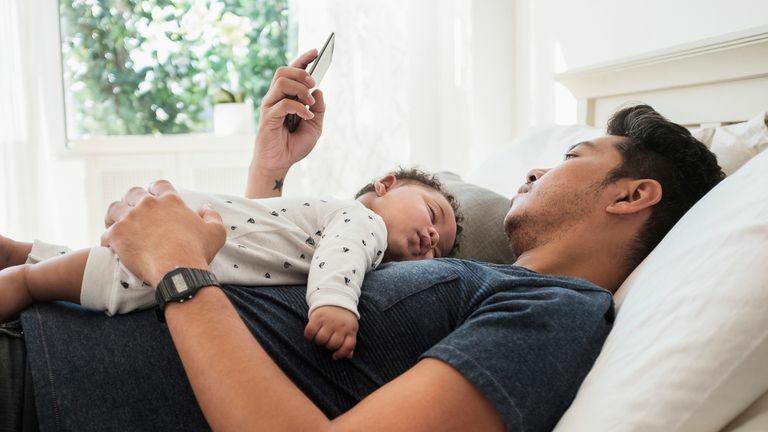 The app uses a combination of randomly mixed sound effects, music, and spoken word files to help you get to sleep quickly and users can specify if they're ready for a long sleep session or a quick power nap. Interestingly, Pzizz also features a Focus mode, which encourages you to focus on a single task for a set period of time while you're awake. It's a strange inclusion, but it works very well. The Pzizz app features an extremely clean design, placing its main features front and center. All of the text in Pzizz is large and easy to read and very little effort is required to navigate from one screen to the next, making it a good app for elderly smartphone or tablet users who often find themselves asking someone for help with their apps. The app and all of its features are completely free on Android. The night light color can be fully customized within the app. Overall design of the app is very basic. The iOS version of Night Light And Lullaby costs $1.99. Young children require something different than some guided meditation to help them get to sleep, which is why Night Light And Lullaby is such a great concept. The app turns your Android or iOS device into a night light that can brighten up the corner of a child's bedroom to help them relax. The colors of the night light are fully customizable, but can even be replaced with a variety of included images. As its name suggests, Night Light And Lullaby also features several music tracks to help kids unwind, too.